Brew Wharf is to be found under the massive Victorian arches by the Thames at Bankside, Southwark. It is the public restaurant in the wine attraction "Vinopolis". Created by award winning (Michelin, Carlton, timeout etc) restaurateurs Claudio Pulze and Trevor Gulliver. The food and service are paramount but with the wonderful opportunity to offer a great beers from around the world. 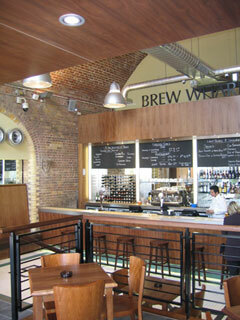 Brew Wharf is located under three massive railway arches, giving it space hard to find in London restaurants. It has an outside terrace, which could be enjoyed during warmer days. The restaurant is suitable for all kinds of parties, especially as you can have your own brew on the bar after spending the whole day with the brewer to learn all there is to brewing process. Well, almost all. Ask for �Brew Day� programme if you are interested. This is the right place in London to taste original beer as this bar restaurant has its own brewery. A selection of European dishes.